Here at FashionBeans, we love a micro-trend. Flying under the radar, and overlooked by the majority, they make it easy to individualise our looks in a stylish and modern way. So, although the market may currently be saturated with high impact, statement-making items such as patterned trousers, floral bombers and mesh t-shirts, the humble band collar shirt is set to have a moment this season due to its prominence within SS14 collections. Also known as a mandarin or granddad collar, the band collar is characterised by its short stand-up collar, which can be applied to shirts, tops, t-shirts and even jackets. Historically influenced by the fashions of China and the Far East, it has now become more popular within the Western world. Subtle yet distinctive, the band collar will help add a point of difference to any man’s current shirting collection – yet, more importantly, in the era of the ‘air tie’ and open collars at formal events, is very much of-the-moment. Turning our attention to the global fashion week previews, several designers included a wide range of band collar pieces without over-saturating their collections. 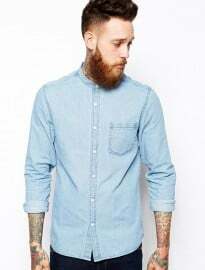 Interestingly, this type of shirt was also popular at lesser known fashion weeks in countries such as India and Sweden, demonstrating the international appeal of the style. In Paris, Lanvin sent two loose-fitting band collar shirts down the runway, combining the subtle styling with vivid colours and patterns. One shirt featured a hot pink base with a contrast grey placket and collar, which was worn buttoned to the top and paired with an oversized black suit and monk-strap shoes. Similarly, a bright blue band collar shirt featuring an all-over pale yellow pattern was paired with a single-breasted tan suit and monk-straps. Likewise, Trussardi went down the loose-fitting, sheer fabric route – featuring a variety of band collar shirts in both block-colours and subtle patterns. Again, the design house favoured translucent, viscose materials. Trussardi also featured band collar t-shirts in white and light grey, some with unusual zip fastenings rather than buttons. In contrast to the Lanvin collection, these band collar pieces were left partially unbuttoned for a nonchalant, devil-may-care look. The collection from Alexander McQueen offered a slightly different take on the band collar shirt trend with its almost Gothic, Edwardian approach. In fact, the looks showcased by McQueen immediately conjured images of the famous American Gothic painting by Grant Wood, which features a solemn farmer wearing a band collar shirt standing beside his spinster daughter – a conservative, clerical aesthetic with a bleak yet interesting feel. A slim-fit, white band collar shirt was used as the anchor piece within many of the outfits, and worn fully buttoned up to the neck. Often layered underneath ivory or black lace vests and completed by wide-legged trousers in a cropped finish, use of layers and crochet floral patterns gave each look a sense of texture and depth. Although there will always be a place for collared shirts in modern society, the band collar enables the style-conscious gent to introduce something slightly different to their current wardrobe. Details recently featured a short article on how easy it is to wear a band collar shirt – rightly pointing out that it’s a versatile piece that can be dressed up or down effortlessly. By highlighting examples such as Yves Saint Laurent wearing a band collar shirt in Marrakech in the 1970s and Mick Jagger doing precisely the same on tour in 1989, wearers of the band collar are in good fashion company. As you can see in the lookbook below, there are two key ways of wearing a band collar shirt: underneath tailoring or as a standalone piece. The beauty of the band collar is that the design naturally provides the differential, meaning you don’t need to go over the top with your styling. Simply combine with your favourite pair of tailored shorts or chinos for a stylish smart-casual look that is perfect for the majority of high summer occasions. Whether you tuck it in or leave it out, button to the top or leave a couple undone, roll your sleeves… this is an item that will adapt to changes in temperature and formality with ease. These days, even the most subtle tweak can make a huge difference to your outfit. Indeed, something as simple as a band collar will give your shirt collection a whole new outlook – immediately altering the aesthetic of your current go-to looks. Not only that, with SS14’s major trends centring on statement-making florals and patterned trousers, this micro-trend offers the everyday male a subtle way of standing out from the crowd without pushing their boundaries too far. But what do you think – is the band collar something you are already regularly wearing? Or are you more of a classicist and would shy away from collarless styles?